The Nets of old would have given up. Down by 25 to start the fourth quarter? Tank the game. Get that L. Add a ping pong ball to your name. Not these Nets though. They’re actually fighting for something now. A Playoff spot out in the East. They didn’t let 25 points come between them and an all-important win. The run started with the Rondae Hollis-Jefferson. RHJ has been with the franchise since 2015. He knows the lows Brooklyn has had. He’s now riding a high and refused to let that go. Then, everyone got into the act. D’Angelo Russell knocked down a three. Then another. Then he started getting to the paint. Agains and again. Before anyone knew what happened, the Nets were down by just two heading into the final minutes of the game. They clawed their way back into the game behind Russell’s hot shooting, Hollis-Jefferson’s leadership and the collective effort of the team. 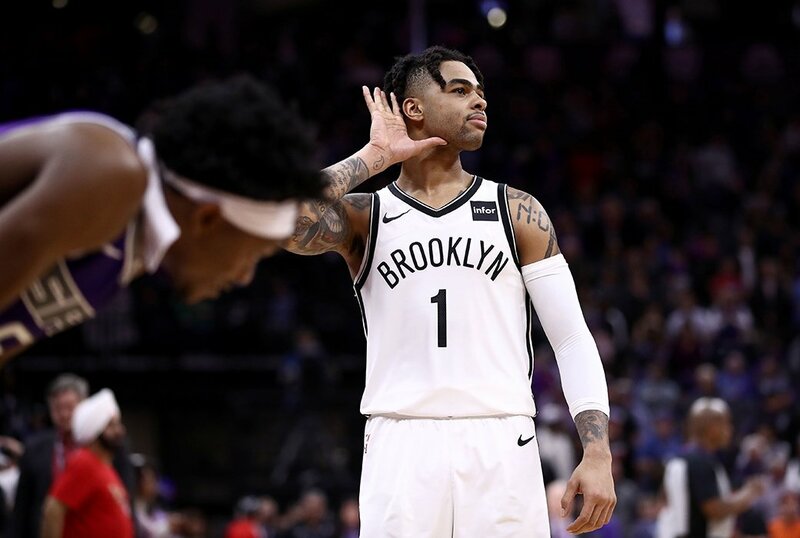 Russell scored his 44th point and 27th of the fourth period on another quick drive to the hoop, bringing the Nets to within one. A possession later, Jared Dudley rained in a three-pointer to give the Nets the lead back. The Kings were able to tie the game on two freebies by De’Aaron Fox. After Russell missed the go-ahead jumper, the Kings had a chance to take the lead. But the Nets played incredible defense and forced a turnover with five seconds left. The Nets tried to go to their hot hand, Russell but the Kings played great denial defense. That’s why the guy that started it all, the longest-tenured Net ended up saving the day for Brooklyn. Hollis-Jefferson drove to the hoop and scored the game-winner with 0.8 seconds left. The Nets completed their incredible comeback. The largest in franchise history. Russell finished with a career-high 44 points with six treys made and 12 assists handed out. These aren’t your old Nets anymore. They’re having fun, they’re playing with pride and they’re actually winning. Brooklyn snapped a three-game losing streak and held on to their seventh seed Playoff spot with a 37-36 record. The Nets want to show that they’re done being a tank. They’re made of stronger stuff, built for the Playoffs. The Hawks quadruple-teamed Harden, forcing him to give up the ball and break his 30-point scoring streak at 32 games. Atlanta was the only team Harden hasn’t scored 30 on this season. Harden flirted with a triple-double, scoring 31 points, grabbing 10 boards and dishing out 10 dimes in Houston’s win over Atlanta. That scoring total meant that Harden has now scored 30 points on all 29 teams in the league this season. He’s the first person to ever have that milestone. Wilt Chamberlain scored 30 on all NBA teams multiple times. But Harden is the first to do it against 29 teams. JJ Redick is known as a shooter. He lingers mostly outside the three-point line, waiting for a chance to put up a shot. That’s why beyond points, Redick doesn’t offer much in terms of stats. Today, he finally ended a streak that lasted 12 years and more than 800 games. Redick finally got a triple-double. He finished the win against the Hornets with 27 points and 10 rebounds, ending a double-double drought of 826 games. Don’t expect Redick to start rebounding at a high rate regularly. But now, at least, he gets the (non-existent) double-double monkey off his back.